A sweet summer treat to beat the heat, an ice cream pizza is a beautiful combination of ice cream and fruit! Place the blondie crust in a small pan. Place three scoops of Rich & Creamy Homemade Vanilla ice cream on top of the crust and smooth evenly. Place strawberries and blueberries over the ice cream. Everything is better homemade—even Vanilla ice cream! 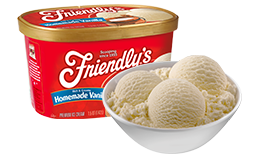 Our extra creamy Homemade Vanilla ice cream is a must-have for make-your-own-sundaes, ice cream parties and every other ice cream occasions!